Mencap Liverpool still has some FREE Run Liverpool Marathon Places available for any runners that want to run on their behalf. The event is Sunday 14th October 2012. Contact 0151 707 8582 or email lois.nash@mencapliverpool.org.uk for more. 5 days of over marathon distance a day? We’ll have to ask Chris Baynham-Hughes who is now in final preparations for tackling this event!! GOOD LUCK CHRIS from everyone at Helsby Running Club. Chris’ fundraising page is http://uk.virginmoneygiving.com/Dragonsback if you want to bung him a few quid. Give him some money, so you don’t have to run it yourself! Our 9th Fell counter of the season saw the green shirt back in the familiar territory of the Clwydians. With wet and blowy conditions for a bank holiday it was a good surprise to find the Cilcain mountain race, which forms part of the Cilcain show, had its highest ever attendance of 181 runners completing the race. Weather improved prior to race start but with a muddy course and particularly windy at the summit near the Jubilee Tower, it all made for interesting running. Jayne Joy ran a blinder coming in half a minute behind Welsh International Andrea Rowlands for 2nd lady overall and 2nd in for Helsby and taking 4 minutes or so off her 2011 time. Ten runners out in total for Helsby and great to see Dave Madders tackling a tough hill race so soon after his Ironman outing, he’s hitting legendary status now. Looks like Phil and Adrian were having a close battle out there too. Afternoon was finished off with a social and enjoyable tea, cake and a nose around the show after the race. Thanks to Joe and Tom and Rachel who were out supporting on the course. A worthy mention should also go to Patrick Stradling who had a fanastic race, finishing 2nd in his category and 15th overall! Well done. No photos yet but Pete Douglas was out on the course so I’m sure they will appear in time. Next fell race counter is our Inter-club race with Spectrum and Tattenhall, which we still have a chance of winning. This race is King John’s Castle on Saturday 22nd September at 11.00am. 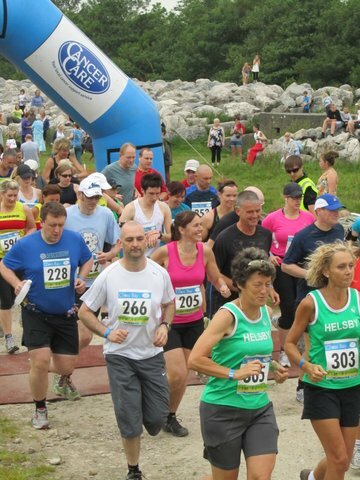 Good turnout for Helsby at last Wednesdays 9th club road counter of the season, the Capenhurst 5k organised by Ellesmere Port Running Club. Conditions were good for running and it was a particularly strong field with the course record being broken by nearly half a minute with an astonishing run from Liverpool’s Johnny Mellor. 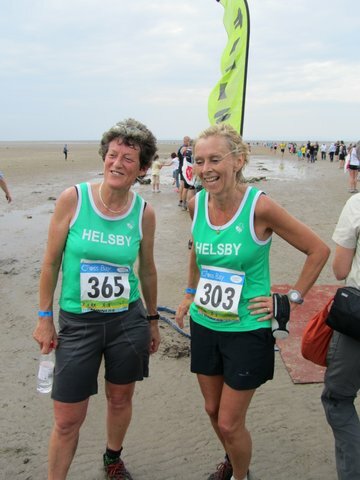 15 out for Helsby with good runs from Jane and Janet that saw podium finishes for their respective age categories. 229 runners completed the race so a big field this year meaning the race also filled up on the night, so unfortunately a few people had to miss out. The next road counter is the Lake Vyrnwy half marathon on 9th September although this is a pre-entry race only. There was another good variety of running and other activities this weekend for us to examine and thanks to Mike Searle for his email regarding Dave’s outstanding achievement from his night-time ironman. (article on above blog link) I’m more than a little bit in awe as I’m sure everyone else is. 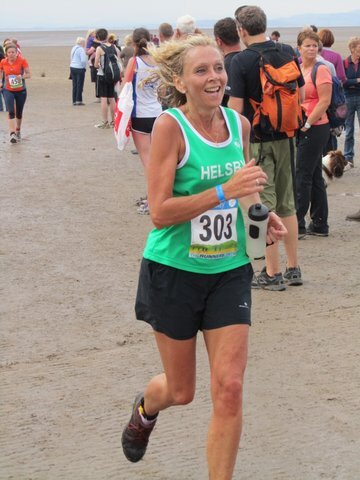 On Saturday 5 green vests were racing the train, and with a train time of 1.48.27 Helsby’s Jane Ashbrook was closest in a big field of over 800 runners. Sunday was the Birchwood 10k which was also a Cheshire Grand Prix event which always attracts a strong field. Spectrum Striders organise this one and preliminary results already on their website. Geoff Shaw was first in for Helsby. Hopefully I’ve not missed anyone but if so please send me details or race reports as I can add them to the blog. Wednesday sees our 9th Road Counter the fast and flat Capenhurst 5k. A local race, often very popular with local runners too but you should be ok to turn up on the night if you haven’t already entered. So once again less than 20 points separates Helsby from Spectrum so all is still to play for! Considering Spectrum had out 5 more runners than Helsby it appears we held our own due to the added points from the first race, as well as missing a couple of our key runners too. It’s good for the series that it comes down to the last race to determine the winner! Disappointingly and due to travel distance Tattenhall were unable to field many runners so we will make sure the choice of races is rectified for next year, possibly moving away from midweek races if need be. The final race in the series is King Johns Castle, more similar to the Druid than Whittle Pike so could suit the trail runner rather than the out and out fell runner. Hopefully we’ll have a few out to challenge Spectrum again. Good luck to those racing the train this weekend! A 9 mile multi-terrain trail race around the Llyn Brenig Reservoir. Starting and finishing at the Brenig Visitor Centre. There will be prizes for category finishers plus a memento for all finishers. Results will be available at www.denbighharriers.com. Entries on the day only. Affiliated runners £6, unaffiliated runners £8. Very quick results for Whittle Pike, race 2 of our Inter-Club Fell series and race 8 of our fell club counters. A tougher location than most to get to for a Wednesday night so was very pleasing to field 15 runners for Helsby. Spectrum had the most with 19 runners out and unfortunately for the competition Tattenhall only four. Hopefully we will try and select a closer race next year. If I can add anything to that I’d say it was also boggy! Not many clean legs after the race and a tricky course in that hitting a bog instantaneously loses you momentum but we had fantastic support from Adrian and Joe on the course which helped. Helsby were in the prizes with Jimmy and Adair picking up a team prize, surprising considering we went the wrong way! Ian Landucci, Jayne, Mario and Janet had age category prizes. If I’ve missed anyone do let me know as I didn’t get to the prizegiving so hoping I’ve not missed anyone. There were some great individual races out there and good to see Helsby faces with war paint too! You’ll have to ask Jayne about that. Jimmy and Adair were close all the way to the top and some brilliant runs from Helsby runners who have not attempted a race quite like this before. Hopefully the sense of achievement more than makes up for the smell of the south Pennines that takes roughly two or three showers to get off completely. I’ll send a separate email for the Inter-club results when officially available, early indications are Spectrum will have won this one but it means it’s all to play for in the third and final race in September. Let’s have a big crowd out for what is a much less difficult race. Not sure Tattenhall can do much to catch up now but it is all still up for grabs. Please comment on the race!